Self contained "Walk in / Walk out" 2 Bedroom House for up to 4 guests. 4.0km to Bendigo CBD, close to the Bendigo Showgrounds (2.0km), Bendigo Health (2.5km) and Lake Weeroona (2.0km). Comfortable cottage consists of 2 bedrooms with Queen beds in each. All linen provided, beds are made and ready. Bathroom has shower over bath (towels provided, face washers, hand towel, toiletries), front loading (Bosch) washing machine, clothes dryer, hair dryer and ironing facilities. The main living area is open plan kitchen, dining and living. There is dining table that can accommodate 4 (6 if you ask for more chairs). Also a breakfast bar with 3 stools.There is a large deck off the living area with Ziegler and Brown (twin burner) BBQ (like a Weber), table and bench seats. Fully equipped kitchen including dishwasher & microwave. Split system heating and cooling in living room and both bedrooms keeps you comfortable year round. Under cover, off street parking for one large car (or two small cars). Small fully fenced yard. NBN connection with unlimited data (exclusively used by you, our guests) with internet download speed of 40-45Mbps (via WIFi modem or direct Ethernet connection). If you are looking to stay in Bendigo and want a quiet place with off-street, under cover, parking and a secure yard, this is the place. Close to showgrounds for all the events there, you could walk (its only 2.0km) or ride, we could show how to get there via bike trail. We are a family of four, two boys 6 and 10 years old. Boys love playing with children staying. We have a great big yard for children to play in (we have one acre block). Been renting the Cottage since 2013 via AirBnB and HomeAway (Stayz), have lots of great reviews. We work hard on providing great value accommodation. Plenty of space, hot water, great air-conditoning /heating, comfortable beds, under cover car parking (off street), fast NBN connection with unlimited data, quiet area. It is the complete package, you just bring food/drinks and simply walk in and walk out. Read any reviews on AirBnb or HomeAway (or Stayz) and you will see our guests are very happy. Daikin reverse cycle units in living area and each bedroom with plenty of capacity to heat or cool. All linen provided, towels, face washers, bath mats. Bed will be made and have 4 pillows per bed. Bosch front loading washing machine. Laundry powder or liquid provided, pre-wash spray also. Laundry basket and pegs if you want to hang them out on the clothes line. Off street and under cover (carport), big enough for two small cars. Dedicated NBN connection with Unlimited Data. WiFi modem. The connection is yours EXCLUSIVELY (ie.no one else shares the WiFi or internet connection). Bosch dishwasher with dishwasher detergent provided. Standard size refrigerator and freezer (NOT a bar fridge). Electric stove top (thermal), 4 hotplates. Electric 600mm under bench oven. Microwave set on high shelf. Olive oil, salt, pepper, vegemite, some jams, tomato sauce. People tend to leave some other items periodically. Two sets of crockery, so you can place into dishwasher with out running out!! Plastic cups and plates for children. All cooking utensils provided. Coffee plunger. 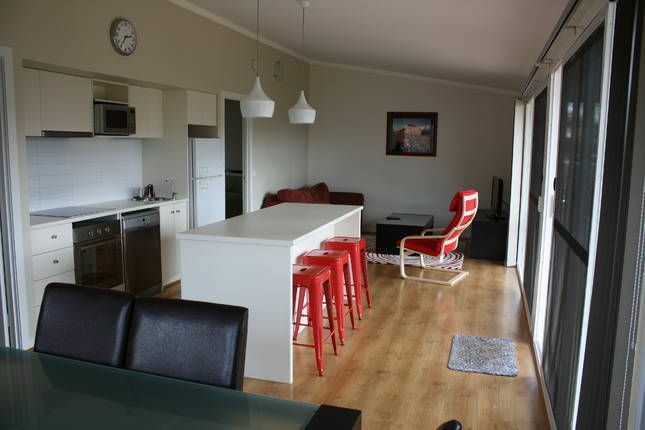 Fully equipped open plan kitchen with breakfast bar to sit 3 people. There is also a dining table that seats 4 people. Dining table for four at end of open living area. Small garden around Cottage but guest are welcome to stroll into our yard. Large deck at front of Cottage with table and seating. I spent 2 days at Ashton cottage. It was so peaceful, relaxing and more. Everything was catered for. Amazing. Very clean and well presented accommodation and well appointed and fully equipped cottage. Our hosts thought of everything to make our stay very comfortable. Exceptionally clean well appointed and fully equipped. Would definitely stay again and would highly recommend Ashton cottage. We had such a great stay at Ashton Cottage. It was in a quiet area and had all that you need for a stay. Highly recommended and will be booking this place again! The property was immaculate, and I'm a real stickler for cleanliness. The owners were good enough to have the windows open for our arrival, on a warm day. Everything has been thought of. Great little deck and bbq. Would definitely recommend. Thanks for having us.